When the new Speaker of the House of Commons, John Bercow, took the chair wearing a lounge suit and tie under his black gown, traditionalists took a sharp intake of breath. But by discarding the Speaker's waistcoat, cuffs and winged collar, Mr Bercow is following in the footsteps of his immediate predecessors. Betty Boothroyd famously cast aside the long-bottomed wig and Michael Martin did away with the knee breeches and tights. 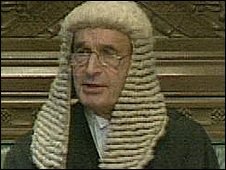 Before them, Bernard Weatherill was the last Speaker to wear the full outfit which was made for him by the tailors of Savile Row, including those at his father's firm. 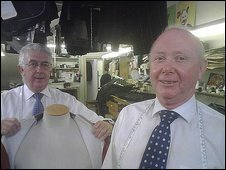 The staff at Bernard Weatherill Ltd - now a subsidiary of Kilgour - were disappointed with Mr Bercow's choice of attire. "I think it's a great shame," said John McCabe. "It adds to the fullness of life in this country," he added, "rather like any soldier's uniform. It's part of the great pageant of British life. "If he's processing through parliament wearing a lounge suit, it detracts from the occasion." Respect for the firm's history and traditions is evident everywhere. "I came on two weeks' trial in 1959 and I'm still waiting to hear if I've got the job," jokes Michael Smith, who has been a tailor at the firm for decades. In the cutting room downstairs, the tailors keep an old book, J P Thornton's International System of Garment Cutting, dating from the early twentieth century. It contains illustrations, diagrams and instructions on how to tailor traditional coats, trousers, breeches and vests. "We call it 'the Bible'", Michael Smith says. He remembers when Speaker Weatherill's outfit was tailored and laments the fact that the Speakers have made changes since then. "I think it's terrible," he says. "I think we should try and stick to tradition. It makes him stand out a bit more from everyone else." But Mr Bercow's modern take works out substantially cheaper than the traditional garb. "In those days it probably cost around £3000," Mr Smith notes. "Now it would be £7,000 or £8,000, maybe even £10,000." Other Savile Row tailors say the slow demise of formal dress has long been predicted. "Everyone was looking at me this morning in the workshops saying this is the beginning of the end for court dress," says Keith Levett, who runs the livery department at Henry Poole and Company. "I've been hearing that as long as I've been in the trade. "But it is sad that someone so high profile as the Speaker in the House of Commons is losing his court dress. "It's stripping away a little of the dignity of the office. "Although I suppose that's questionable in the light of what's gone on in recent weeks."